Huskies will turn to Andrew Kirkland and Luke Wattenberg to replace Adams at left tackle. Andrew Kirkland has the experience. Luke Wattenberg has the upside. The loss of junior Trey Adams to a season-ending knee injury means the No. 12 Huskies will have a new left tackle for Saturday’s game against UCLA, and the job for now will be a time-share opportunity for Kirkland and Wattenberg. Kirkland, a senior, was the Huskies’ sixth offensive lineman for the first half the season. 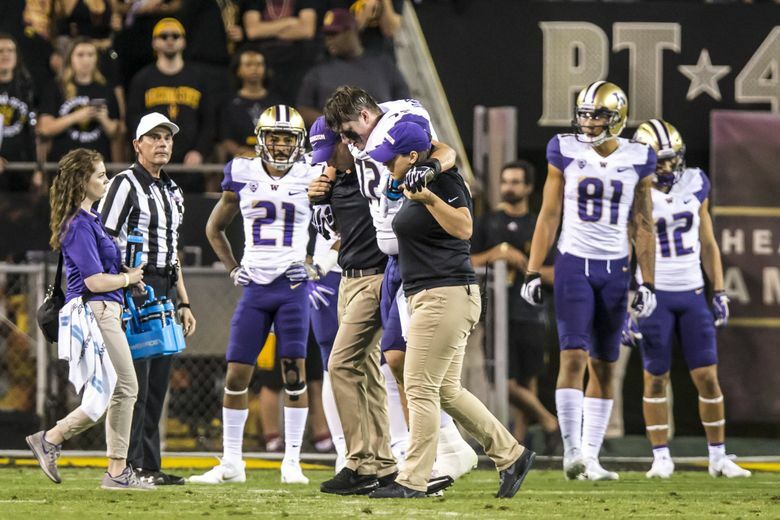 He took over at left tackle for the final three quarters during UW’s loss at Arizona State after Adams was injured late in the first quarter. “Whether we won or lost, you lose a player like Trey, you’re going to have to have a chip on your shoulder,” UW offensive line coach Scott Huff said. “Because it’s time for everybody to man up. Kirkland, 6-feet-4 and 321 pounds, has started 12 games at four positions in his UW career — including two starts at left tackle at the end of 2015 season, when Adams was injured — and coach Chris Petersen calls Kirkland “The Fireman” because he has the ability to rescue the line at several positions. Wattenberg, a 6-4, 295-pound redshirt freshman, was a coveted four-star recruit out of JSerra Catholic High in Southern California. He lost about 30 pounds with an illness in the summer of 2016 and redshirted last fall at UW. He had another setback during fall camp this summer when he missed about a week’s worth of practices with an arm injury. Wattenberg has played in five games this season, mostly in mop-up duty. He is athletic enough that UW coaches played him some at tight end when Drew Sample was out with an ankle injury earlier this season. Huff knows what Adams is going through. As an all-conference center at Boise State in the early 2000s, Huff had serious knee issues of his own. Wednesday morning, he revealed a foot-long scar running vertically down his right knee, a reminder of knee-replacement surgery he had years ago. Huff will help Adams through the rehabilitation process as best he can. “He’s in a good spot, as good as you could possibly be in for everything that’s happened,” Huff said. “Unfortunately, football’s a gladiator sport and these things happen, and it’s really all about your mindset. The next step is getting that thing fixed and rehabbing from there. Unfortunately, I’ve been through a lot of that stuff before and I understand it, and hopefully I can help him out as well as the rest of the team. With kickoff at 12:30 p.m. (for an ABC national broadcast), Saturday’s homecoming game against UCLA marks the Huskies’ first day game of the season. Could it also be UW’s first sellout of the season? As of Tuesday afternoon, UW had distributed about 67,000 tickets for Saturday’s game. Washington has had just two sellouts at Husky Stadium (capacity: 70,083) in its last 29 games going back to the 2013 season. UW has already announced that it has sold out the Nov. 25 Apple Cup at Husky Stadium.